*Disclaimer - I am not affiliated with Allure (or any of the product brands featured in this post). I have not received compensation for this post in any form (monetary or otherwise). I paid for the products I've tried and all opinions voiced on this blog are strictly my own. I was in need of a lightweight lotion. I had many bottles of Bath & Body Works lotion, but I’ve never been impressed with them as far as moisturizing skin goes. They just smell nice. The only other lotion I've used on a regular basis is Jergens' Natural Glow, but I’m not impressed with it either because I've never seen a difference in my skin tone. I initially started using it because I have sunspots on my upper arms, shoulders, and back (also known by the medical term Tinea Versicolor), and they make me self-conscious. I feel like Spottie Dottie when I wear sleeveless tops or dresses (some who suffer from Tinea Versicolor have spots that are darker than their normal skin tone but mine are always lighter). There are some days I won't wear anything without sleeves. Anyway, I thought the Natural Glow might help by darkening the spots or by evening out my skin tone. It didn't work, of course, because the spots aren't the result of an uneven skin tone but the result of a fungus that flourishes in our humid climate (which is gross, I know)! But, I hate the way that lotion smells too. It’s horrid. And its consistency is way too heavy. With that said, I was ready to try a new lotion product. 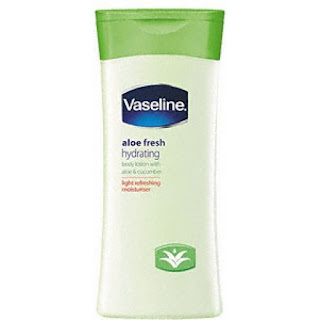 Vaseline’s Aloe Fresh definitely delivers. I can understand why this lotion made Allure's list for three years in a row! It's lightweight, absorbs quickly, and smells really good. The scent has just a hint of cucumber. It makes the skin feel soft and cool, and you know the aloe in it is doing wonders for your skin. I bet it feels great on your skin after a day out in the sun too. hi, I was wondering if this cream helps you with your spots. I have the same condition and nothing has taken them off.